Olentangy’s Colton Doup, left, competes against Orange’s Tristan Bluntschly during Wednesday’s Division I Regional Wrestling Dual Team Tournament at Delaware Hayes. Third-seeded Olentangy led 28-20 with four weight classes to go, but second-seeded Westerville North picked up points in all four to notch a win in the quarterfinals of the OHSAA Division I Regional Wrestling Dual Team Tournament Wednesday night at Delaware Hayes. The Braves’ Corey Hill (170 pounds) notched a dominant 10-2 decision to give his team its eight-point edge. 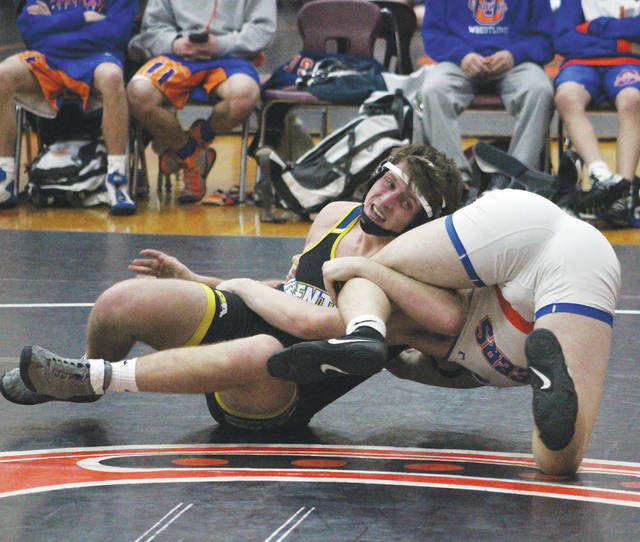 Jacob Sherman (113), Nick Varanelli (126), James White IV (138) and Alexander Gore (145) also had a hand in building the lead, each pinning their respective opponents. That’s when the Warriors turned it on, though. North’s Mitch Potterf and Bodi Bien picked up back-to-back wins at 182 and 195 to give the Warriors a lead they never relinquished. With the win, Westerville North will take on top-seeded Marysville, Delaware’s other quarterfinal winner, in next week’s regional semifinal. Olentangy was the only one of the three Delaware County teams in action to win its first-round showdown. It knocked off Olentangy Orange 55-13 thanks to wins from Jackson Moses (106), Sherman, Varanelli, Brady Pethtel (132), White IV, Gore, Avery Flanagan (152), Brace Kade (160), Hill, Colton Doup (182) and Cameron DelGratta (285). The Pioneers, meanwhile, got wins from Zack Miller (120), Alex Lopez (195) and Cardan Mutai (220). Delaware Hayes was also in action, but, like Orange, was one and done. The Pacers finished strong in their opening-round showdown with Upper Arlington, but couldn’t climb out of an early hole. Hayes scored the last 27 points to tighten up the score, but ultimately fell 41-30. Mason Sutandar (170) started the rally by pinning the Golden Bears’ David Soghomonyan in 3:08. Jacob McCloskey (182) followed it up with a 5-2 decision over Holden Freeman and Zane Hypes (195) and Nathan Robinson (220) added back-to-back pins to keep the late-match run alive. Hayes’ J.P. Lantz then picked up a forfeit win in the heavyweight division to smooth out the scoring summary. Zach Williams (132) was the Pacers’ other point producer. The junior blanked UA’s Joey Orlando 4-0.